Ft Pierce Mayor, Linda Hudson, joined the Panther Battalion Cadets for the Annual Military Ball held on Friday, February 13th. 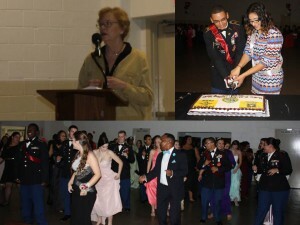 Mayor Hudson was the key note speaker for this year’s ball which was held at the Ft Pierce National Guard Armory. Cadets honored traditions such as the posting of the colors, military toasts and the grog bowl ceremony. The Panthers also let their hair down with a catered dinner and lively dancing. District 1 City Commissioner, Reginald Sessions also attended and rewarded the Cadets with an inspiring speech about “Achieving Your Dreams.” Ft Pierce 19th Judicial Circuit Drug Court Manager, Ms. Cathy Buzzolani, rounded out the Ball VIPs. American Legion Post 171 Commander, Willie Smith presented the Legion Leadership Award to Cadet Brandon Green and the Academic Award to Cadet Maria Arriola. Cadets Dustin Vanderpool, Carlos Success, Daisy Arriola and Sean Neff received the JROTC Association of the United States Army Award from Executive Vice President, Space Coast Chapter, LTC (R) Gerald Soltis. Mayor Linda Hudson speaks to Cadets. Panther Ball King and Queen, Brandon Green and Maria Arriola cut the cake. Commissioner Reginald Sessions shares the dance floor with Cadets.